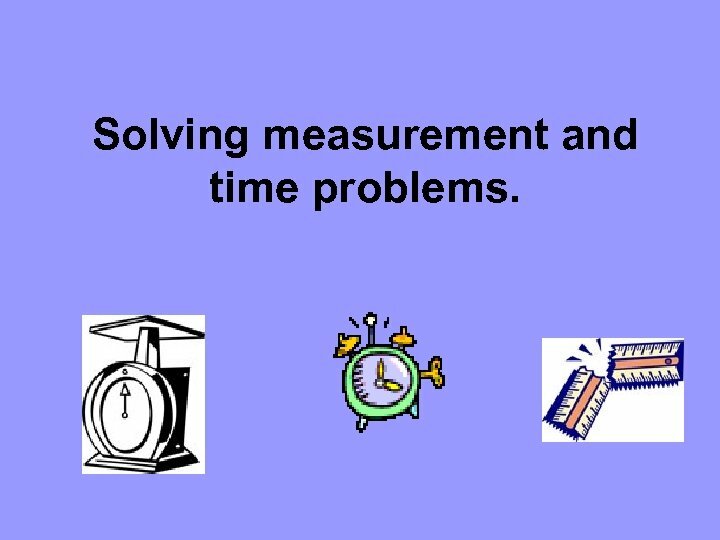 Solving measurement and time problems. 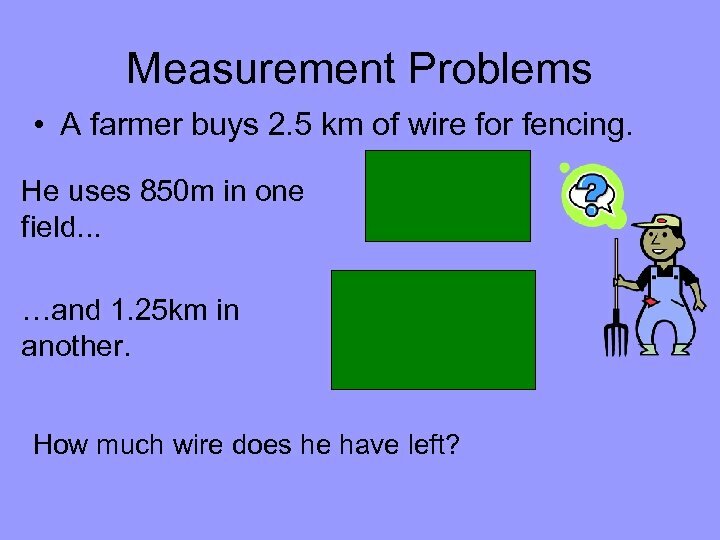 Measurement Problems • A farmer buys 2. 5 km of wire for fencing. He uses 850 m in one field. . . …and 1. 25 km in another. How much wire does he have left? • A farmer buys 2. 5 km of wire for fencing. He uses 850 m in one field and 1. 25 km in another – how much does he have left? Convert the units so that all the measurements are in the same unit: 2. 5 km = 2500 m 850 m 1. 25 km = 1250 m Do the calculations: 2500 – 850 = 1650 – 1250 = 400 m or 0. 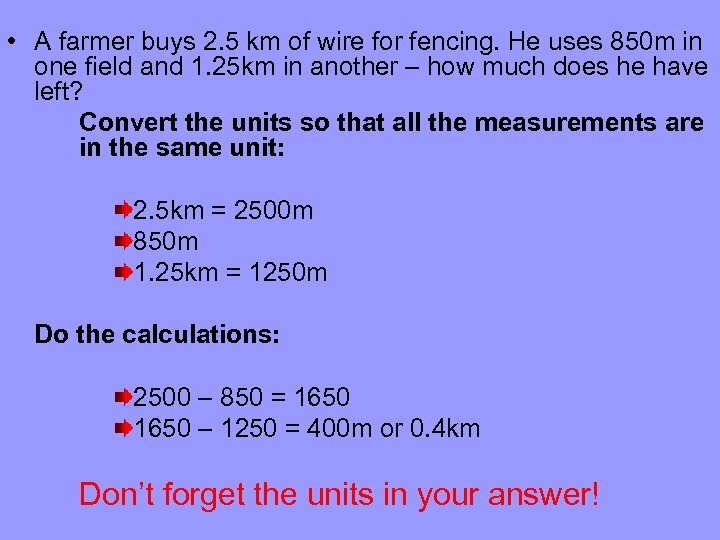 4 km Don’t forget the units in your answer! 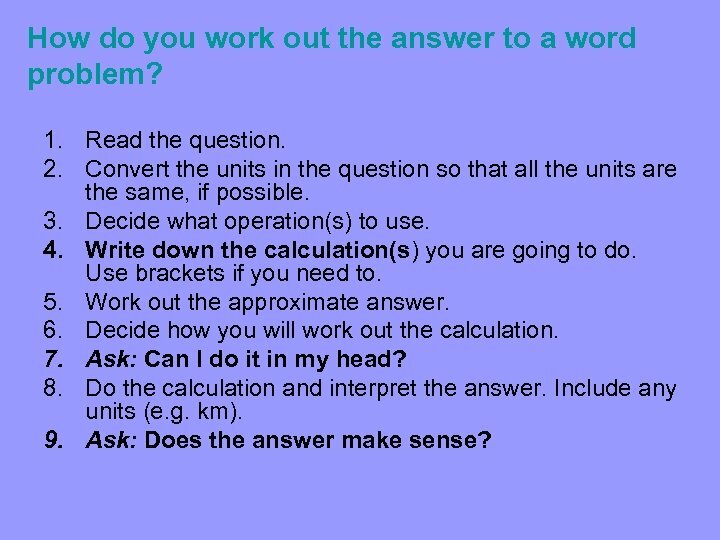 How do you work out the answer to a word problem? 1. Read the question. 2. Convert the units in the question so that all the units are the same, if possible. 3. Decide what operation(s) to use. 4. Write down the calculation(s) you are going to do. Use brackets if you need to. 5. Work out the approximate answer. 6. Decide how you will work out the calculation. 7. Ask: Can I do it in my head? 8. Do the calculation and interpret the answer. Include any units (e. g. km). 9. Ask: Does the answer make sense? Time Problems • Mr Jones leaves his house at 7. 30 am to travel to school. He arrives at school at 8. 07 am – how long does his journey take? 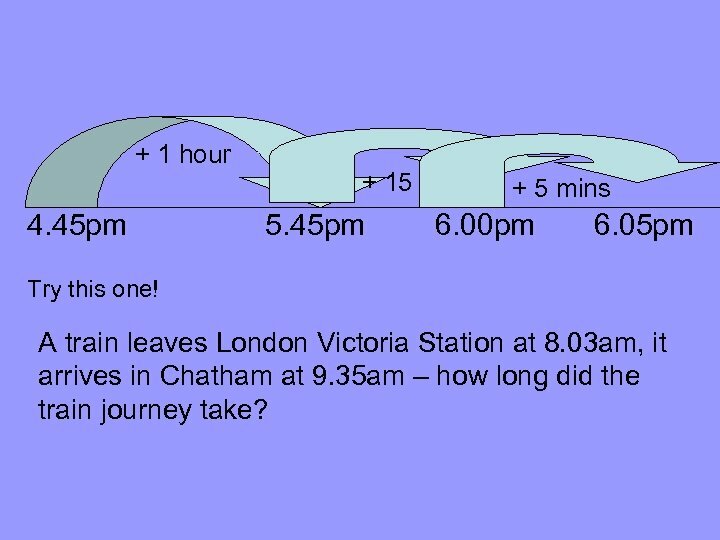 • Answer: 37 minutes • How did you work it out? • You could have used a time line… + 30 mins 7. 30 am + 7 mins 8. 00 am 8. 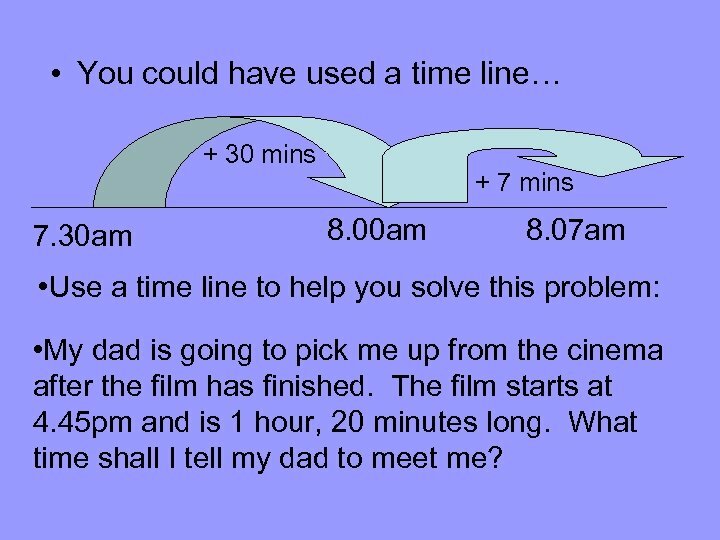 07 am • Use a time line to help you solve this problem: • My dad is going to pick me up from the cinema after the film has finished. The film starts at 4. 45 pm and is 1 hour, 20 minutes long. What time shall I tell my dad to meet me? + 1 hour 4. 45 pm + 15 mins 5. 45 pm + 5 mins 6. 00 pm 6. 05 pm Try this one! A train leaves London Victoria Station at 8. 03 am, it arrives in Chatham at 9. 35 am – how long did the train journey take? + 1 hour 8. 03 am 9. 03 am +30 mins 9. 33 am +2 mins 9. 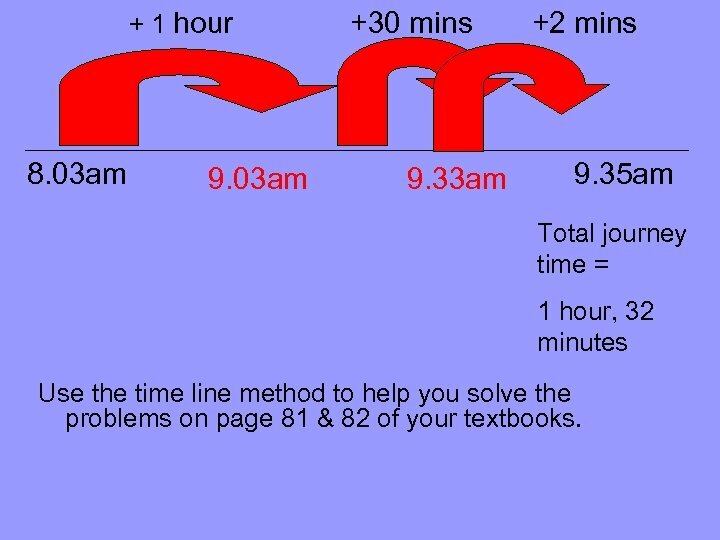 35 am Total journey time = 1 hour, 32 minutes Use the time line method to help you solve the problems on page 81 & 82 of your textbooks.